Ta kontakt med oss for fargeprøver eventuelt større fargemengder. 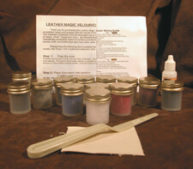 Now, you can have the ultimate in Leather Restoration. 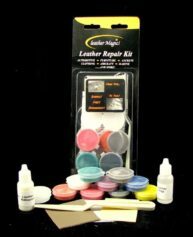 Our Deluxe Leather Repair Kit will provide you with all of the materials you will need to make permanent, invisible repairs to damaged leather, and replace the finish as well! Our Leather Repair compound provides the strongest repairs possible, by permanently bonding to the edges and surface of the leather. This repair compound has been formulated to remain extremely soft and flexible,and recreate the natural look and feel of even the finest leathers. Repair cuts up to 4” long, and holes up to 2” diameter (larger repairs will require additional materials. Pleasecall us for details). Enough Colorant Material is included to cover the seating area of a regular sized sofa or two front bucket seats in automotive applications. After you have completed the repair, you will then be able to completely cover over the damaged area with a new color coating. This color coating will blend the new finish into the surrounding leather, and create a completely invisible repair that matches the original leather. This combination will produce Professional quality results that you will be proud to have done yourself! Best of all, we mix the color for you! Simply choose from one of our custom mixed colors from our color charts, or provide us with a sample of the color that you need. We will mix the color to your specific requirements.Click Here to find out where to send your sample and order information. Obtain your Color ID Number from our Color Charts and paste into the Color Choice box or Click Herefor the address to send your sample.